“As much as people in the game today like to think they are the makers of the game, they are the keepers of the game – the game was made a long time ago by a lot of people,” says Hall of Famer coach and player Mike Ditka, an opening sentiment that sets the table for the entire “Blood Equity” DVD, a look into the dark side of ‘America’s Biggest Blood Sport,’ football, a sport you and I both love, and maybe even obsess over. 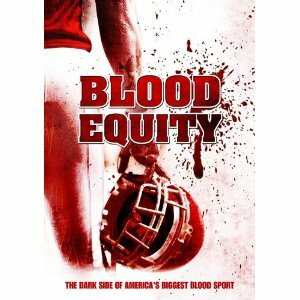 “Blood Equity” is a much needed wake up call regarding the harsh realities many retired pro football player’s face once they step off the gridiron and hang up their cleats. Whether it be injuries that took them off the field, or just time and age, it seems most retired players get the same treatment from the National Football League Players Association (NFLPA), shallow pensions and no benefits. The films poor production value is surely prevalent, but it doesn’t take anything away from both the overall message of the documentary and the real testaments given by the former players who are enduring these issues day in and day out, some who happen to reside in Canton, Ohio in the NFL Hall of Fame, and their families. Former players like Hall members Ditka, Mel Renfro and Willie Wood, Daryl Johnston, Junior Bryant, John Mackey, Harry Carson, Toby Wright, Tony Dorsett, Joe Delamielleure, Donnie Green, Bruce Laird and Steve Atwater, pour their hearts and mind out to the camera on “Blood Equity,” making it close to a must see for all current NFL players and fans alike. It’s not just a group of players you’ve never heard of on “Blood Equity,” it’s not just a bunch of guys the filmmakers were able to cut and paste together, these are some of the game’s greatest players, guys who redefined their positions like Wood, Ditka, Dorsett and Atwater. The subject matter is incredibly powerful, and the stories portrayed are the main focal point, even though the rough and choppy editing of the film does distract to a point. It does manage to keep your attention throughout, and while some points of views from the NFLPA side of the story would have been helpful, “Blood Equity” should be seen by all fans of the sport, and it should serve as a splash of cold water on the face of the current NFL, fans, die-hards, and players alike. Many fans of the sport might not know what dangers these players face after it is all said and done, and “Blood Equity” is a good place to learn. Is football really ‘America’s Biggest Blood Sport’ as “Blood Equity” bills it? Press play and decide for yourself.